But I won’t argue the point too hard. 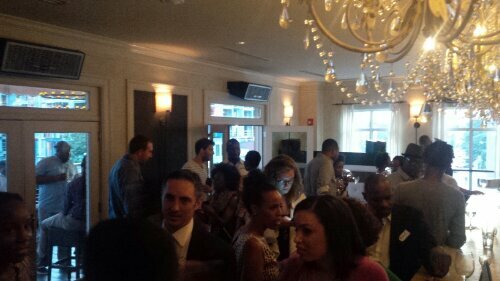 Yesterday evening, I attended the DC Africa Tweet up hosted by Semhar Araia. I learned about the event through Twitter and had a blast chatting it up with folks addressing the task of contributing to African development from different angles. Of the ~60 or so people at the event, I met three through Twitter – Laura Seay, Semhar Araia, and Teddy Ruge. The statistical analysis may not make much of that, but these are three people who have a significant impact on my thinking in regards to Africa. Since joining Twitter, my connection to people doing work on the continent has grown exponentially, and has created opportunities to do a lot of cool things. There are other potential reasons for this increased connection, I do admit. Nonetheless, I am in constant communication with folks regarding Africa and I am not the only one. 1. I got a better understanding of how Africare sees itself participating in African development. 2. I offered some advice to a recent graduate looking to get into international development work. 3. I connected with individuals interested in a partnership Afara Global is part of. 4. I learned about the work of an individual in London who could offer some nice value-add to one of our projects. 5. I had an incredible conversation with a fellow Greensboro-native on the opportunity areas for growth in the African-American community. Needless to say, I left the event refreshed and excited to push forward. Thanks Semhar and Twitter. Let’s make this happen in other cities.